New Delhi, Feb 13 (IANS) Than Myint from Myanmar suddenly woke up at around 4.30 a.m on Tuesday in her hotel room, struggling to breathe. With her sleepy eyes, all she could see was smoke. Sensing something was wrong, she woke her room partner Khi Khi Chod and both rushed out of their third floor room to see an adjacent room was already ablaze and the passage clogged with smoke. Myint called out to her fellow travellers two rooms away. But she was too late. Mya Htwe and Hla May failed to open the door, having suffocated to death. 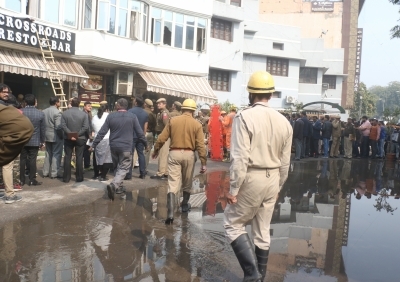 Htwe and May were among those 17 who lost their lives in the major fire that broke out during the early hours at a five storey hotel in Delhi's Karol Bagh. Myint, along with her three co-travellers, had come to the Ram Manohar Lohia Hospital, to identify the bodies of Htwe and May. "We didn't knew where to go and whom to meet. Even our guide (a Myanmarese man living in Bodh Gaya) died in the fire. Language also became a problem. We haven't eaten anything and went to two more hospitals before coming here," Khi told IANS. Recalling the horror of the moment, they said that while they battled to breathe, visibility inside the hotel was another issue. "We didn't knew what to do, we were clueless. Our brains were not working that moment. And then we couldn't even see anything clearly. We rushed down to second floor and tried to jump out of the window," Khi said. Myint recollected that they called out for help from a window that was open. Some of the neighbours came up with ladders but those were not high enough to reach them. "One of our group members couldn't wait long and attempted to get out by clinging to a rope. But she fell and has injured herself badly... her back bone is broken as we have been told," Myint said. Fearing for their lives, Khi mentioned that the four others were were also on the verge of attempting to jump but meanwhile the firefighters had come to the spot and rescued them. Myint said that they no longer feel staying in India anymore. "We didn't knew each other but what happened is tragic, painful and horrific. We lost everything, from clothes to money. We have got in touch with the embassy which has requested us to return. Let's see what we do," she added. The hospital authorities and police said that body of two of Myanmarese women will be sent back after the embassy issues a letter to the police.